Tag line: "She may not survive them"
Hellions, a 2015 horror film directed by Bruce McDonald (Pontypool), starts innocently enough, with 17-year-old Dora Vogel (Chloe Rose) snuggling up to boyfriend Jace (Luke Bilyk) under a tree on a sunny afternoon. It’s Halloween, and after making plans to attend a costume party later that night, Dora leaves Jace and heads to the doctor’s for what she believes will be a routine check-up. Instead, Dr. Bob (Rossif Sutherland) delivers the shocking news that Dora is four weeks pregnant. Devastated, she makes her way home, saying nothing to her mother (Rachel Wilson) about her condition. A few hours pass. Dora’s mom takes little brother Remi (Peter DaCunha) trick-or-treating, while Dora waits patiently at home for Jace to arrive, so she can tell him he’s going to be a father. Suddenly, there’s a knock at the door. It’s a kid (Joe Silvaggilo) with a burlap sack for a mask, holding out a bag, waiting for candy. Dora chastises the youngster for not saying “trick or treat”, but gives him some candy anyway and shuts the door. A while later, there’s another knock; it’s the same little kid, this time with a friend wearing a bucket on his head (Emir Hirad Mokhtarieh). She tries to tell them there’s no more candy, but they won’t leave. Nor do they utter a word, until one of the tykes sticks out his hand, touches Dora’s tummy, and mutters, in a guttural voice, “Mama”. From that point on, Hellions becomes a wildly stylish, occasionally frightening, and ultimately frustrating motion picture experience. It isn’t long before these kids start wreaking havoc: smashing pumpkins, breaking windows, and much, much worse. When her stomach begins to hurt, Dora calls Dr. Bob and asks him to come over. Unfortunately, he himself is victimized by the precocious urchins, and barely escapes with his life. A frantic call to 9-1-1 results in officer Corman (Robert Patrick) eventually arriving on the scene, and even though he’s had a run-in with these kids before (years earlier, when they were tormenting his wife), he’s not prepared for just how evil they truly are. Why won’t these little monsters go away? What do they want from Dora? And where is that voice in her head coming from? As Hellions progresses, director McDonald pulls out all the stops, utilizing different color patterns (sometimes sepia-toned) and negative images (the trees in several scenes have white leaves) to suggest Dora has entered another realm, where fantasy merges with reality, and nothing is as it seems. The look of the kids who are terrorizing Dora is also unsettling: all are in Halloween costumes, and along with the two who arrived earlier, there’s one dressed up like Red Riding Hood (Aliyah Jhirad) and another that resembles Raggedy Ann (Sydney Cross), and both are equally as dangerous as their friends. In addition, I liked the scene where a wind storm breaks out in the kitchen of Dora’s house (while she’s on the phone with 9-1-1), and to see one of the kids crawling upside-down on the ceiling (after they make their way inside) sent a shiver up my spine. Clearly, these are not ordinary children. The problem with Hellions is that it wears out its welcome well before it ends, with McDonald taking us on one too many journeys into the unknown, where quick cuts and bizarre imagery are the norm; and some of what happens later on is downright silly (I could have done without the pumpkin patch minefield). 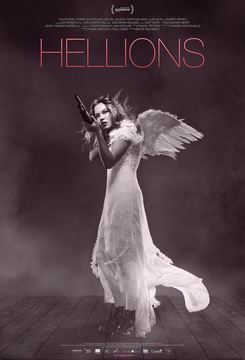 This, along with a few fake endings and the odd confusing dream sequence, do their part to make Hellions a pretty good hour-long horror film that, alas, is dragged out to an hour and twenty minutes. Now, I'm intrigued. I loved PONTYPOOL and want to see what all the talk's about. Thanks for a great review, Dave! I rather liked PONTYPOOL. I may give this one a look.